To bring about the discipline, you need the rigor of standards and processes. However the rigor can turn into rigidity that restricts judgment and stifles creativity. On the one hand, there is a need to establish rigor with a sound governance structure, on the other there is a demand for freedom and flexibility. This is indeed a primordial paradox between the need for discipline and freedom at the same time. This dilemma hounds the successful implementation of project management and PMO processes. Indeed project management methodologies and PMO practices are often guilty of inflicting too much process, like requiring your project managers to complete two weeks of project documentation on a one week project. It is akin to installing an elaborate security system on a cookie-jar, with a detailed process for removing cookies to prevent your child from eating too much sugar. The question is how do you find the sweet-spot of where you can achieve the right balance of rigor without the rigidity? 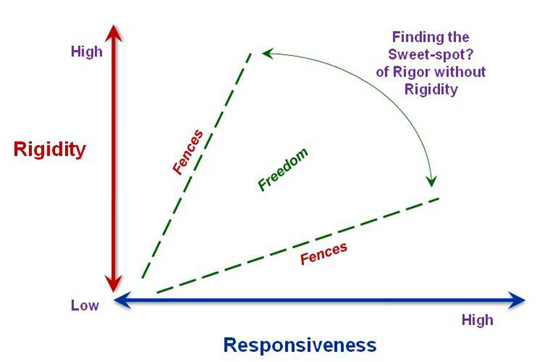 You have to seek the balance between the extremes of rigidity and responsiveness as illustrated in the figure below. Rigidity can be defined by a heavy emphasis on formal structures and control, standard methods and processes, top-down governance with dictated authority, responsibility and decision making. Responsiveness means the project management practices or the PMO is responsive to the stakeholder needs. It emphasizes flexibility, adaptable and customized processes and self-regulating governance with shared authority, responsibility and decision making. The very purpose of implementing project management and PMOs is to achieve discipline. Either extreme of rigid processes or, flexibility with no standards is not desirable as well. 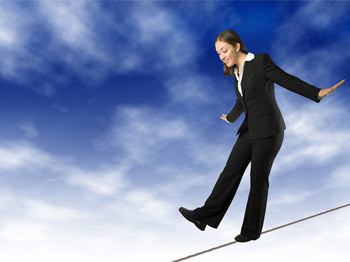 It is imperative to find the right balance, which can depend upon a number of factors like your organizational culture, the nature of your business, and your organizational project management maturity. One of the ways to achieve this balance is to think of the idea of freedom with fences, a concept that was popular internally at Harley-Davidson, Inc. The concept enables employees to understand both the limits and the latitude they have to make improvements in their work processes. While your organization implements project management practices, to the extent possible, develop and raise the fences of processes and methods in a collaborative manner. They should be permeable and flexible with built-in mechanisms for feedback. And of course they should provide enough freedom for personal judgment, creativity and innovation. How do you find the sweet-spot to Balance..